Don’t overlook your vision care – we rely on our vision in everyday life more than any other of our other senses. However, we often overlook our vision and only see an eye care professional when there is a problem or when we feel it’s time to update a prescription for glasses or contact lenses. Dr. Susan Freed-Gilvey, OD, joined our staff in February 2017. She is an Optometric Physician licensed by the New Jersey State Board of Optometrists in the treatment and management of ocular diseases. She is a Diplomate of the American Board of Optometry. Dr .Freed graduated with honors from the Pennsylvania College of Optometry in Therapeutic and Ocular Disease Management and Low Vision Therapy. She also performs pediatric exams and specialty contact lens fittings. At Manhire Opticians we feel your periodic eye exams should be an important part of your routine preventive health care. Many eye and vision conditions do not have any symptoms, so you may be unaware that a problem exists. The good news is that with regular eye exams, early detection and treatment can occur and help you maintain your good vision and prevent any serious problems. 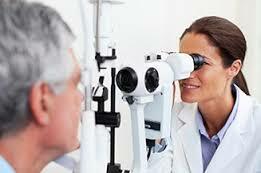 We offer a complete eye exam, including the glaucoma test. After your exam you will have the confidence of knowing your eyes are healthy and if a correction is needed, the doctor will prescribe the correct prescription for eyeglasses and/or contact lenses.